Candy Haystacks is a simple and yummy recipe for cooking with kids. 2 cookie sheets lined with margarine greased waxed paper, cut to fit cookie sheets. Pour morsels into microwavable bowl and microwave at 15-30 second intervals, until melted, stirring each time. Place bag of chow Mein noodles in another bowl. Pour melted morsels over the noodles and toss together with large spoon. When all the noodles are well coated, drop by tablespoons onto greased wax paper on cookie sheet. Allow to sit and harden. 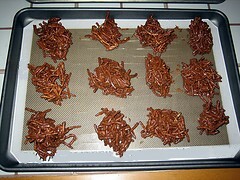 The finished product looks like mini haystacks and adds a fall atmosphere to any table. Because of the ease in making them you can enlist the help of children, so it is a fun activity as well as a treat. If you're a kid at heart and desire to make them yourself, go ahead. I always get remarks on how tasty and cute they are.